For diehard football fans, it’s all about team loyalty, favorite players and the ability to spit out the recent stats of both. Not many fans have that same kind of relationship with the referees, though. This relationship isn’t as complicated – if a referee makes a good call for your team, he’s a hero but if he makes a lousy call that goes against your team, he’s a bum. But have you ever wondered what referees do when they’re not dressed in stripes, running up and down the field blowing whistles and dropping flags? They don’t have a full-time job like the team players, coaches and executives. For these “weekend warriors,” officiating is a labor of love. For Lance Burage, director of officials for the National Gay Flag Football League (NGFFL), his day job is in the radio industry. He’s the program director for 93.1 WPOC country music radio located in Baltimore, Maryland. But when Gay Bowl XVI is held next month, Lance will be in charge of 46 officials, a record number for this year’s tournament. And he characterizes his job of keeping all 46 of those Type A personalities going in the same direction akin to herding cats. Although he now lives in Baltimore, Lance grew up in southern Alabama, in Tuscaloosa to be exact. And in spite of his lifelong passion for football, he says he’s never been big enough to play the game. He did play some baseball up through ninth grade and then spent time in high school with the band, playing saxophone and serving as the drum major, perhaps since it allowed him to be at every football game. According to him, he was the kid at the back of the band bus with the radio up to his ear listening to scores from all the football games, particularly the University of Alabama’s Crimson Tide (Roll Tide!). He wound up attending college there, bringing with him his high school talent for radio announcing. Now having spent over 20 years in the business, it’s all been in country music radio, mainly because when he applied for a job at a variety of stations, it was a country music station that called him back and hired him. He spent time working throughout the south but never abandoned his love for football. In fact, Lance says he was always attracted to the officiating side of sports and had often thought about getting the necessary training and certification to become an official. During time spent in Florida in 2002-2003, he was unemployed after his station changed its format. He decided that if he was ever going to follow his dream of being involved in football officiating, this was the time to do it. And for the next 10 years he officiated at high school games across Florida, Alabama and Georgia serving as a line judge for eight years and then a referee for the next two years. It wasn’t until after a move to Atlanta in 2007 that Lance discovered a local gay flag football league and he jumped at the opportunity to be a part of it. The next year he was officiating at Gay Bowl VIII in Salt Lake City when Cyd Zeigler, co-founder of the NGFFL told him he was good at the job and then asked if he would consider becoming the league’s head official. Since then Lance has developed more consistency within the growing number of the league’s officials. While individual referees may be better at the rules, at managing the game or at dealing with the players, he’s developing a cohesive cohort that thinks and acts with one brain. In addition to a book of rules and standard training on them and any new modifications, the group also has a mechanic’s manual that, among other things, tells an official where to stand to get the best view on different plays. This is especially impressive when you remember that all these officials are volunteers and are only together in a large group once a year for the Gay Bowl. The NGFFL is a competitive league with a lot of physical contact, and when talking about the women’s division players, Lance says their level of play and their competitiveness and aggression is equal to the men’s. He notes that the only rule difference is that the women use a smaller football – they’re even welcome to play in open division play. On a personal level he says the only difference for him in officiating a women’s game is that at 5-foot-7, he can often see over their heads which is an advantage. 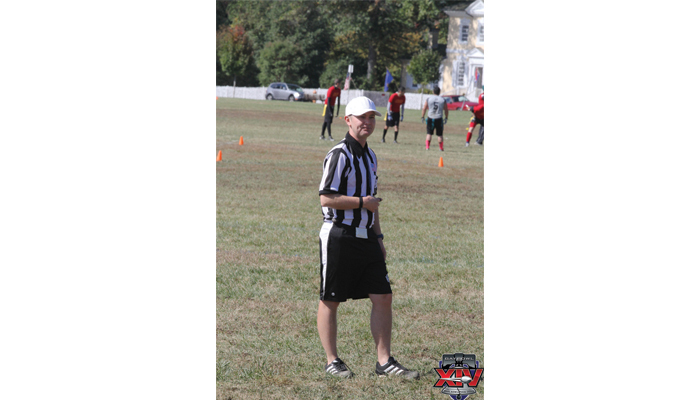 Since moving to Boston with his husband, Brad (together 13 years, married for two) in 2013, Lance now officiates in the DC Gay Flag Football League. Last year he was inducted into the NGFFL Hall of Fame which he considers an incredible honor. As he looks back at his years officiating the game he loves, he says it has taught him to develop lots of patience and the ability to keep things under control. But the most important gift he believes he’s gained is a general rounding out of his life skills. So the next time you watch a football game, you may just look at the referee in a whole new way, appreciating the training and devotion the job requires. He or she may actually be a talented community hero, just like Lance Burage.